Chef Laszlo Bevardi, executive chef and proprietor of Bevardi’s Salute! 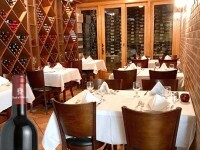 Restaurant, located in downtown Sarasota, Florida announces a Tuscan Wine-Pairing Five-Course Dinner on Wednesday, April 17, 2019 from 6:30pm at Bevardi’s Salute Restaurant featuring exquisite wines from the Restaurant’s private estate winery in Tuscany, "Casali di Bibbiano Winery" producing super Tuscan wines. Space is limited so tickets are required and can be purchased by calling 941.365.1020. The five-course wine-pairing dinner is $99 plus tax and gratuity. Casali di Bibbia is an 18th century country estate in Tuscany, producing award-winning wines and olive oil. More information about the estate and winery is available at destinationcasali.com. Bevardi’s Salute Restaurant is proud to serve a variety of wines from their Tuscan winery, “Casali di Bibiano” along with their high-quality olive oil pressed from the olive trees on the Tuscan estate.